Reading fluency can be defined as the ability to smoothly and quickly read sentences and phrases while making sure that everything that a reader reads is well-understood. This means that reading fluency is not only all about learning how to read fast. It also involves understanding the sentences and phrases so you will generate expressions of complete idea from reading. If you want to become an expert in fluent reading, then you should bear in mind that this process sounds smoothly with the right amount of natural pauses. It is also defined by experts as a process which involves the rate or speed of reading and the capability to clearly read materials combined with the right expression and tone. Reading fluency is extremely essential for every individual especially those who are already working since this offers a bridge between the recognition and the comprehension of words. It is also important because it allows readers to focus on clearly understanding texts. One of the most effective ways to learn to read fluently is to try the model fluent reading approach. This approach requires you to listen and effectively comprehend the specific way fluent reading sounds. You can then transfer what you have observed when it is already your turn to read. Other ways to improve your reading fluency is to perform repeated readings, use phrased reading and hire an efficient tutor. If working as a reading fluency expert is one of your major goals, then be aware that Brainmeasures can provide you with a high quality online certification course called reading fluency certification program. This reading fluency course is perfect for you because it is detailed enough that you will get the chance to efficiently polish your skills and strengthen your background in this specific area. It allows you to take part in a reading fluency training which explains in full detail the scope of this process, the different ways to improve your reading fluency, the different tools that you can use to make various approaches designed for fluent reading work, the importance of learning how to read fluently, ways to improve your comprehension skills and how you can also keep track of your progress. Receiving a reading fluency certificate from Brainmeasures is really rewarding since this will serve as a strong representation of your competence. Where to ask for help when you are having a hard time improving your fluency in reading? 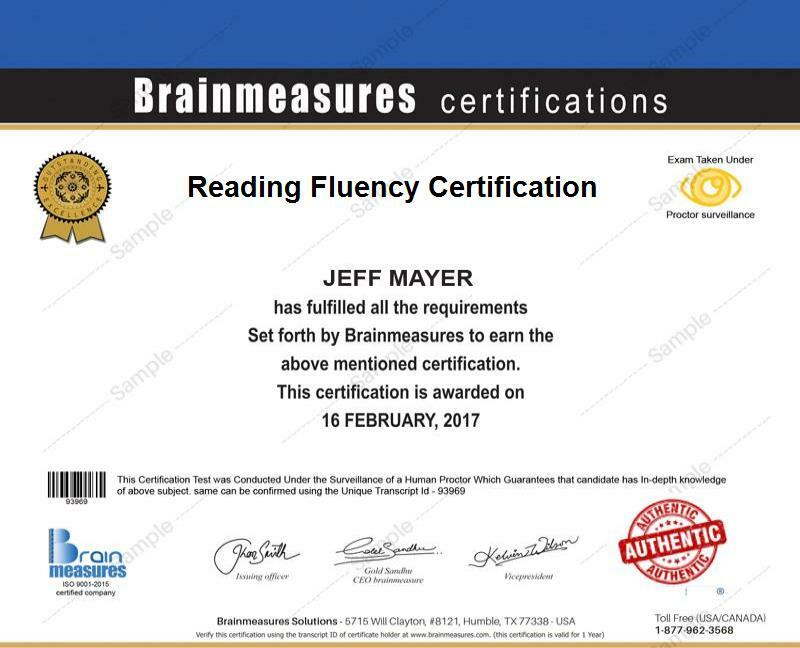 The reading fluency certification program which is now available at Brainmeasures is developed in such a way that individuals and professionals will be able to enjoy reading while comprehending everything that they have just read. This program is also perfect for teachers, training teachers and other individuals and professionals whose job involve monitoring and constructively critiquing the reading fluency progress of students. Your reading fluency certification is also a huge help if you are planning to enjoy a significant increase in the level of your salary. With the help of your certification, you will get the chance to work as a reading fluency specialist and receive at least $48,000 every year. You can also take advantage of your certificate by using it to work as a reading fluency tutor and earn around $41,000 to $85,000 annually.